In which country do you want to participate? 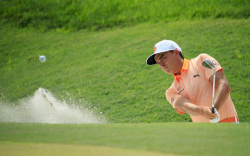 Join Mercedes‑Benz and Rickie Fowler for the Mercedes‑Benz After Work Golf Cup season. Hey there to all my fellow golfers! No time for the golf course? Feeling frustrated at having to juggle work and family commitments in order to fit in a round of golf? Or are you ready to take your game to the next level? I think I have the answer: The Mercedes‑Benz After Work Golf Cup! With the Mercedes‑Benz After Work Golf Cup you can now play a tournament round after work. The international roll-out of the Mercedes‑Benz After Work Golf Cup shows that nine-hole tournaments are not just a short-term trend, but a real alternative to the classic 18-holes, especially for younger, working golfers. So exactly what you are looking for! Our highly attractive annual international raffle prize is exactly the right motivation for you to play in the Mercedes‑Benz After Work Golf Cup! The international prize will be raffled after the last tournament in December 2018.